On Monday, February 7th, The Drama League is honoring the one and only Patti LuPone at its annual benefit gala at the Pierre Hotel. This year, the 27th annual, will feature performances in a musical tribute to Patti by Audra McDonald, Laura Benanti, Anika Noni Rose, Michael Cerveris, Scott Wittman & Marc Shaiman, Boyd Gaines, along with Christopher Sieber, Chad Kimball, Liz Callaway, Will Chase, Nick Adams, Emily Skinner, Justin Guarini, Michael Urie, James Monroe Iglehart, an ensemble of 90 performers, and “Life Goes On” co-star Chris Burke. 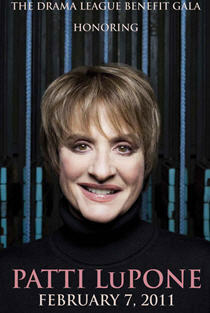 Patti's frequent and long-time collaborators David Mamet, Brian Stokes Mitchell, Mandy Patinkin and Stephen Sondheim are the Gala’s Honorary Chairs. I worked as a volunteer at last year's 26th Annual Benefit Gala honoring Angela Lansbury and had a marvelous time. The performance was to die-for and I expect nothing less this year. I am thrilled to be volunteering again this year for this amazing organization. Plus, the Drama League knows how to throw an excellent party! There are still tickets available for the whole shebang, which includes an open bar cocktail party, perusal of fabulous silent auction items and a seated dinner, or through today only, you can purchase a ticket to the performance only, which includes everything but the seated dinner. These limited available seats are $300 and if like last year, worth every penny. You can order these seats by calling 212-244-9494 ext 26. Ticket sales end on February 4, 2011.